International Student House of Washington, DC (ISH-DC) is a space where graduate students from 40 countries engage with each other on a daily basis. This is a place where substantive dialogue is encouraged and common ground can be found over a conversation in the library or around the dinner table. Lifelong relationships are formed and remain firm as our resident scholars head all over the world to begin their careers and take on the challenges of representing their countries. International Student House is a place where diplomacy begins for our future leaders. 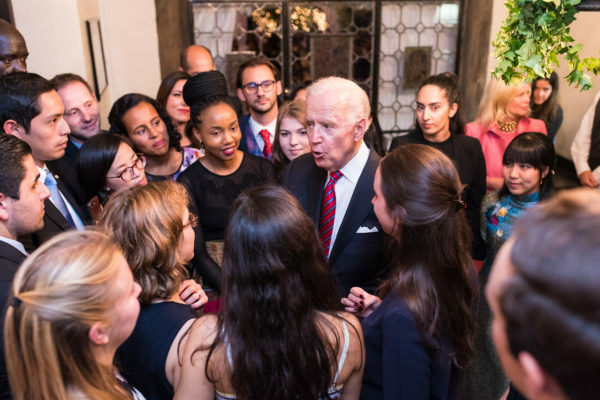 Joseph R. Biden, Jr., the 47th Vice President of the United States, with ISH-DC Resident Scholars from Japan, South Sudan, Hungary, Germany, Italy, Russia, the Philippines, Mexico, Vietnam, Rwanda, the Netherlands, and Nigeria. On the evening of October 4, Ambassadors from over 15 countries, Members of Congress, special guests, and International Student House resident scholars gathered to honor Joseph R. Biden Jr., the 47th Vice President of the United States, with our 2017 Global Leadership Award for his service to our country and exemplary work on behalf of international dialogue and higher education. It was an incredible evening as we honored the 47th Vice President and celebrated the mission of ISH-DC. ISH-DC Board President Cynthia Bunton, opened the evening by welcoming our Ambassadorial guests and Members of Congress, and thanked our many sponsors. Patrick Davies, Deputy Ambassador of the British Embassy, spoke on behalf of our 2017 Diplomatic Chairs Sir Kim Darroch, the British Ambassador, and Lady Darroch, followed by our resident scholar from South Sudan, Atem Malak, who introduced former Vice President Joe Biden and shared about his experiences as a resident scholar at International Student House. 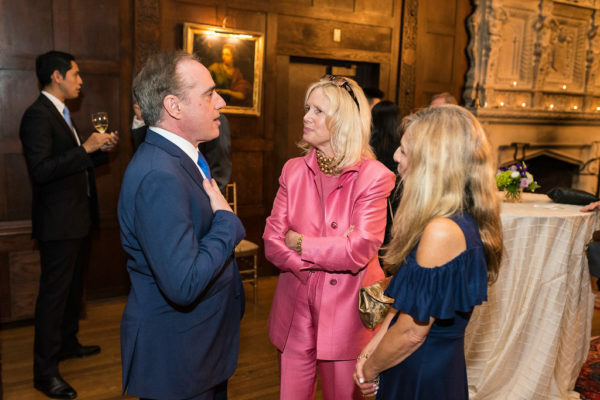 Secretary David Shulkin, United States Secretary of Veterans Affairs; Dr. Susan Blumenthal Markey, 2017 Global Leadership Awards Honorary co-Chair; and Dr. Merle Bari. 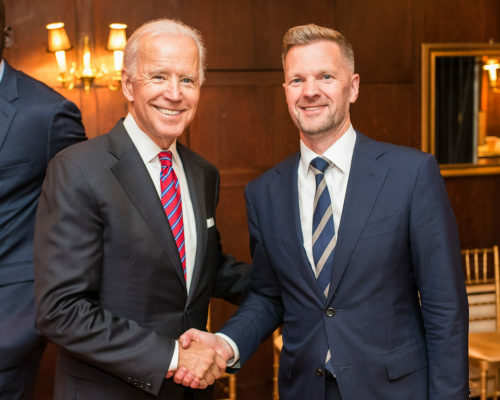 Former Vice President Biden and Patrick Davies, the Deputy Ambassador of the British Embassy. Former Vice President Biden spoke at length about the importance of international understanding and dialogue. He then imparted substantive advice to our many resident scholars who participated in the evening, which will forever remain a highlight of their time here in Washington and at the House. The evening ended with wonderful remarks by our Honorary co-Chair, Dr. Susan Blumenthal Markey, and Awards Dinner co-Chair Didi Cutler. Our many guests who joined us for the Global Leadership Awards had the opportunity to meet our resident scholars and learn that International Student House is a community where we embrace diversity and value the unique contributions of all residents, which we know makes us stronger and will have a lasting impact on future generations. We are grateful to our many friends and sponsors who allow us to continue the mission of ISH-DC, which began over 80 years ago. 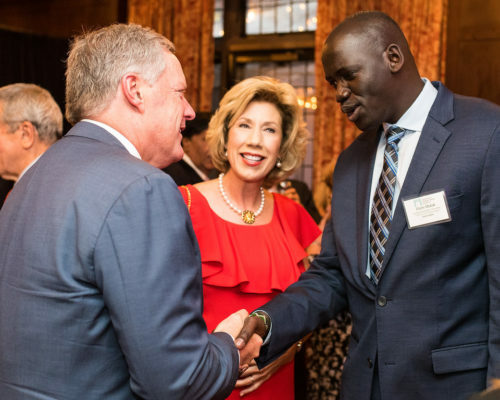 Congressman Mark Meadows and Debbie Meadows meeting ISH-DC resident scholar Atem Malak from South Sudan. 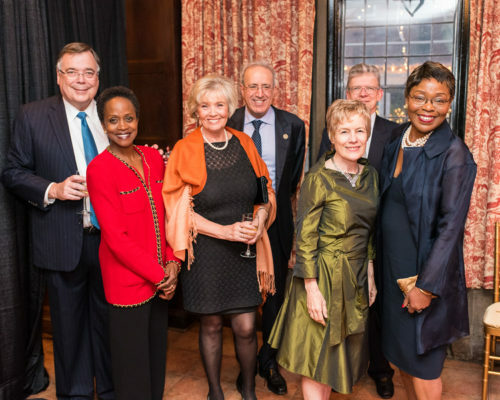 HE Geir Haarde, Ambassador of Iceland; Dr. Esther Brimmer, CEO of NAFSA; Inga Jona Thordardottir; Elias and Annette Aburdene, ISH-DC Board of Directors; Eric Melby, ISH-DC Board of Directors; Cynthia Bunton, President, ISH-DC Board of Directors. Once again, we would like to thank our generous sponsors who support our House so that we can provide a unique cross cultural experience to develop students and scholars into global citizens. 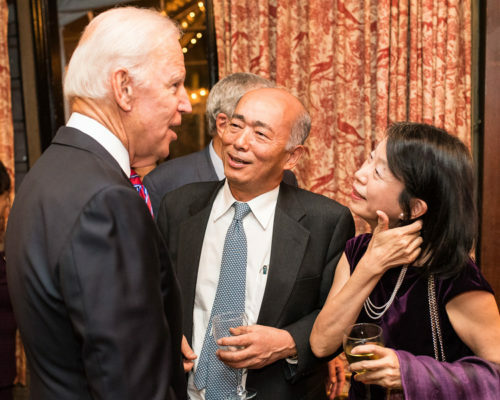 Former Vice President Biden with HE Kenichiro Sasae, Ambassador of Japan, and Nobuko Sasae. Click HERE to view many more excellent photos from the Awards Dinner.